Ben will present from Morrill Science Center II, Room 134. If you are on the UMass Amherst campus, please join us in Morrill II, room 134. To join the webinar online, follow the link above. Webinar ID: 509-677-032. This webinar does not require a password or registration. Participation is on a first-come, first-served basis. 2) To join the audio, choose either internet audio (with good bandwidth) OR call (669) 900-6833 or (646) 876-9923 followed by the meeting number, 509-677-032. 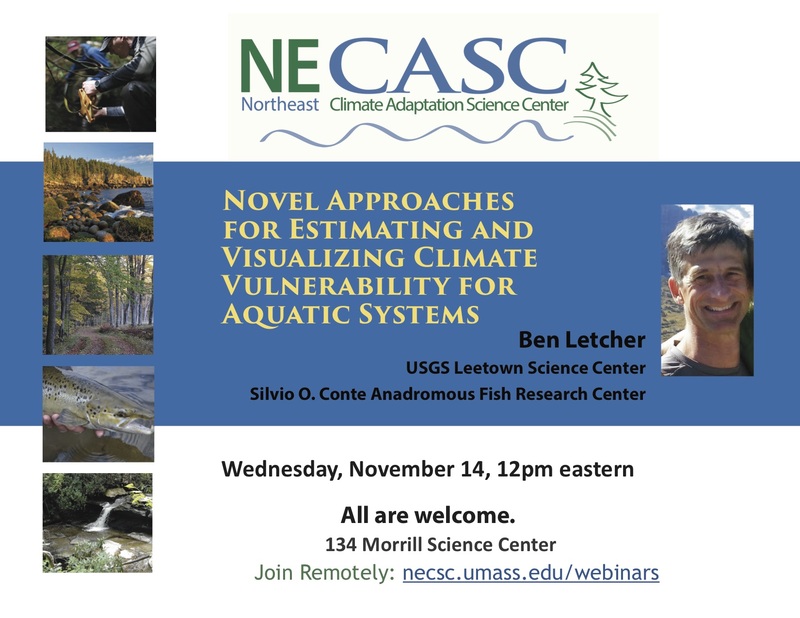 Ben Letcher, USGS Leetown Science Center - Silvio O. Conte Anadromous Fish Research Center will present novel approaches for estimating and visualizing climate vulnerability for aquatic systems. Abstract Vulnerability assessments combining components of exposure, sensitivity and adaptive capacity are complex. Yet, many resource management decisions are based on vulnerability assessments. Could we improve decision-making by making vulnerability assessments more transparent and easier to understand? In this talk, I will demonstrate a few existing vulnerability assessments and show examples of ways to visualize vulnerability. We will explore characteristics of visualizations that convey information quickly and whether interactive visualizations improve the speed of understanding. We will also discuss how considering ways information will be visualized at the beginning of a project can help focus goals and increase project development efficiency. We will end with a discussion of future visualization needs for risk and vulnerability assessments.